A vibrant, growing city of approximately 156,000, Eugene, Oregon has managed to retain its small-town charm while increasing its economic and cultural amenities. Home to some of the best educational and recreational opportunities in the state, it’s a great place to call home. A college town at heart, Eugene offers a plethora of dining and shopping options for even the most discriminating consumers. Downtown Eugene, known for its eclectic spirit, features diverse establishments such as Ambrosia Restaurant & Bar, Anderson Watchmaking, Big River Grille, and Dalia’s on Broadway. The 5th Street Public Market is especially known for its restaurants and bars. During the summer months the Saturday Market meets downtown with food and vendors that are uniquely Eugene. Valley River Center is home to numerous household names, including American Eagle, Champs Sports, Foot Locker, Game Stop, JCPenny, and Macys, as well as several lesser known, but tasty, dining establishments. Oakway Center provides additional restaurants and shops such as Chapala’s Mexican Restaurant, P.F. Chang’s, Nordstrom Rack, Old Navy and Nike Town. Situated at the southern end of the Willamette Valley, Eugene, Oregon’s mild year-round climate ensures outdoor enthusiasts get ample opportunity to enjoy the area’s fantastic recreational amenities. Famous seaports and coastal cities, such as Astoria, Tillamook and Florence are within easy traveling distance. The McKenzie River, famous for its whitewater rafting and riverfront fishing, is only a short distance away along scenic Highway 126. Residents also can go skiing, snowboarding, snowshoeing, sledding, camping, hiking, and mountain biking in the Cascades Mountains. Closer to home, Eugene’s various parks, open spaces, trails, pools, and natural areas provide plenty of opportunities for outdoor enjoyment. At 100 acres, Skinner’s Butte features rock climbing columns, a children’s playground, hiking and biking rails, a community garden, picnicking areas, and breathtaking views of Eugene’s splendid vistas. Residents can cool off, work out, and soak in some sun at Amazon Pool. Nature lovers can get a quick peek at the region’s birds and wildlife at the Bertelsen Nature Park. Ascot Park, the largest athletic field complex in the city, features 13.13 acres of ball fields, soccer fields, and running tracks. With 42 miles of shared-use paths, 35 miles of signed bikeways, and 81 miles of on-street bicycle lanes, walking and biking are also popular activities in Eugene. 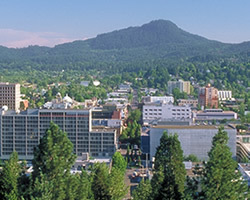 “A Great City for the Arts and Outdoors,” Eugene, Oregon is recognized across the region for its outdoor adventures; varied array of museums, art galleries, and theaters; and its numerous celebrations, from the rustic, hippy-inspired Oregon Country Fair to the Oregon Bach Festival and the Oregon Festival of American Music. Residents also participate in various active neighborhood associations, City Council, and regular city events. A thriving city, Eugene is expected to grow by another 25,000 to 30,000 people in the next two decades. Homes for sale in Eugene offer something for every buyer and include a wide range of styles, sizes, and prices. Median home cost in 2012 was $192,200. Primarily known as home to the University of Oregon and the Ducks, Eugene has several other higher education options including Lane Community College and Northwest Christian University. The Eugene School District operates numerous highly rated public elementary, middle, and high schools in the area, as well as several exceptional magnet and charter schools such as Eugene International High School, the Arts & Technology Academy, and the Family School. Eugene is also home to many private schools including the Eugene Waldorf School, Ridgeline Montessori Public Charter School, The Village School,. Health facilities in Eugene include everything from physician’s offices and medical clinics to urgent care centers and specialty hospitals. The Willamette Valley Cancer Institute and Research Center conducts research and offers patient-centered care, including nutrition counseling, support groups, and oncology social services. The Neuro-Spine Institute features a runner’s clinic and a wellness center, and offers imaging services, physical therapy, and out-patient surgical procedures. Sacred Heart Medical Center provides acute-care and emergency-care services to area residents. Getting around Eugene and the surrounding area is easy. Interstate 5 connects to the city to Roseburg, Grants Pass, Medford, Ashland, and Sacramento to the south and Salem, Portland, and Seattle to the north. Many residents bike or walk to work on the city’s numerous trails and paths. Others catch a ride on one of the Lane Transit District buses. Amtrak’s Cascades route offers service throughout the Pacific Northwest, and the Eugene Airport connects residents to airports across the country.